Powdered garlic is usually made from garlic cloves that have been chopped and dehydrated. Minced the garlic can be converted to powdered garlic, too. 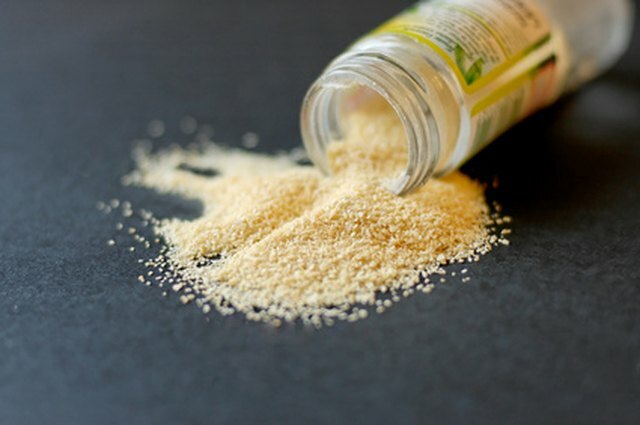 Some recipes call for using powdered garlic in place of fresh, while others recommend using powdered garlic more like you would use salt or other sprinkled seasonings. 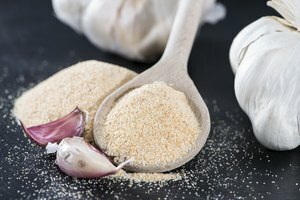 Powdered garlic keeps for over a year, though it does not have the same flavor as fresh garlic cloves. Generally, 1/8 teaspoon of powdered garlic is equivalent to one clove of fresh, although garlic varies in flavor and intensity. Use peeled garlic that has been peeled and minced without being crushed. Spread the minced garlic out evenly on a plate or baking sheet. Be sure the pieces do not overlap. The simplest way to dry minced garlic is to simply set the tray or plate in a sunny window. You can also place it outside if the weather is warm and dry. Make a tent out of cheesecloth to keep bugs and dust off the garlic and make sure it is sheltered from wind. The garlic should dry within three days, depending on ambient air temperature and humidity. 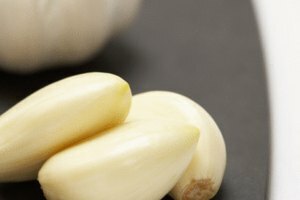 To dry the garlic more quickly, you can use a food dehydrator or oven set to the lowest temperature. You will need a dehydrator with a fine screen that prevents the tiny pieces from falling through. If using an oven, set to the lowest temperature possible. 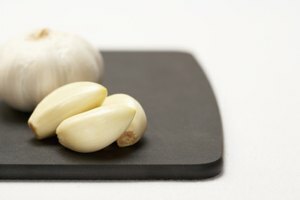 If you have a gas oven, the pilot light may provide enough heat to dehydrate the minced garlic. If it is safe to do so, prop the door open to provide better air circulation. Check the garlic after one hour to make sure it is drying and not cooking. Stir or turn the garlic pieces two or three times per day. Rub off pieces that stick to the plate so they dry evenly on all sides. Depending on your climate and ambient temperature, the garlic should dry in one to three days. 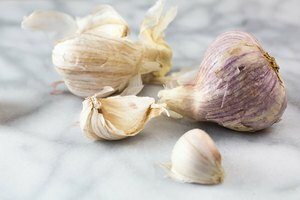 When the garlic is completely dry, you can store as is if you prefer a coarse texture. If you prefer a finer powder, grind in small batches using a spice mill or clean coffee grinder. You may be able to grind in a food processor or blender, depending on the blades and settings. You can combine the garlic with salt to make your own garlic salt, or mix it with dried herbs or spices to create your own seasoning blend. Store the powdered garlic, garlic salt or seasoning blend in airtight glass jars or resealable plastic bags in a cool and dark location. Powdered garlic is concentrated. Add in small quantities while you are cooking, and allow the flavor to fully blend before tasting. The garlic will darken while drying. If it browns, your oven temperature is set too high. Minced garlic will cook too quickly at a high temperature. Lisa Jensen grows organic food and lives in an adobe house that she built. She teaches aikido, is an experienced back-country skier and backpacker and is active in her community. A graduate of the University of Calgary, Jensen writes about gardening, home projects, social sciences and sports and recreation.